We saw the above sign while walking through the airport. I interviewed some people at the airport and though some said they enjoyed the trip, they ALL said they were here to reach a definite city or place. Imagine an airport concerned only with random journeys and not definite destinations? Every single person at the airport was there not for the journey but to reach a definite destination. 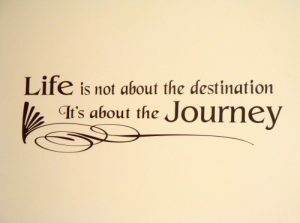 All of life is a profound journey but with very definite destinations: Heaven or Hell! If you’re on the travel through life ONLY for the thrill of the trip you’re in BIG trouble. You better set your sites on the ultimate destination — heaven! Nothing is more important. And remember that entrance gate to heaven is very narrow so plan well! From Steve and Janet Ray at the Paris Airport today on a journey to a definite destination — Jordan and Israel and Egypt, but ultimately to heaven. Great point! I’ve seen church signs that say, “Seize the Day!” or “Don’t worry about the future, only think about the present.” These things more or less teach that today is important and the future is not. But you are right that the destination is the important thing. Good critique.